When you purchase the featured book special OUT LIVE YOUR LIFE below, a percentage of proceeds will go to support Habitat for Humanity. The remaining books are more great deal features on wonderful books that you should also own. These are difficult days in our world's history. Billions of people are poor; millions go hungry or thirsty every day. Disease claims thousands of lives daily. But you and I have been given an opportunity to make a big difference. What if we did? What if we rocked the world with hope? Infiltrated all corners with God's love and life? We are created by a great God to do great works. He invites us to outlive our lives, not just in heaven but here on earth. What if you lived in such a way that your death was just the beginning of your life? Love Does shares powerful stories coupled with eye-opening truths and empowers anyone who longs for a better world and a richer faith. You don't need another Christian message or a self-help book. You need to have your paradigms about the world shifted into truth. That's exactly what you get in Love Does. Have you ever noticed that the real change in your life-the growth that sticks and becomes a part of you-never happens with a program or the sheer grit of your best efforts? It happens over time, like a glacier slowly carving valleys through the mountains. In this book of compelling stories coupled with eye-opening truths, author Bob Goff shows you a new way to live, a way that's drenched with the whimsy of God's love and the spontaneity of following where he leads when he says "Go!" In this book, you learn what it looks like to be secretly incredible and advance God's kingdom everywhere you are and wherever you're going. For anyone who's wanted to change the world but thought they needed money, a committee, and permission to get started, Love Does shows what can happen when you decide to do instead of plan, act instead of strategize, and fiercely, invisibly fight for the possibility God has gifted you to uniquely see. Do you see it? It's right there on the horizon, next to the morning sun? It's a chance and a choice. An opportunity to make this a great day. After all: "This is the day the Lord has made. We will rejoice and be glad in it. "But what of those days when the traffic snarls, airports close, and friends forget? Despite the hang-ups and bang-ups of life, every day is filled with the hope of a God-given purpose and promise. 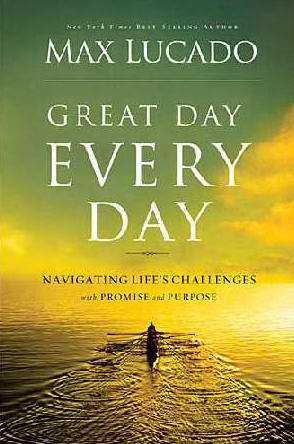 In Great Day Every Day Max Lucado unpacks Jesus' blueprint for upgrading each of your days to blue ribbon status: saturate your day in Jesus' grace; entrust your day to His oversight; accept His direction. Grace. Oversight. Direction. G-O-D. The perfect prescription to fill your day with divine power and peace and make it a great day every day.This new title from Max Lucado has been previously published as Every Day Deserves a Chance. Full of beautiful, heart-wrenching, and hilarious stories, A Million Miles in a Thousand Years details one man's opportunity to edit his life as if he were a character in a movie. Years after writing a best-selling memoir, Donald Miller went into a funk and spent months sleeping in and avoiding his publisher. One story had ended, and Don was unsure how to start another. But he gets rescued by two movie producers who want to make a movie based on his memoir. When they start fictionalizing Don's life for film—changing a meandering memoir into a structured narrative—the real-life Don starts a journey to edit his actual life into a better story. 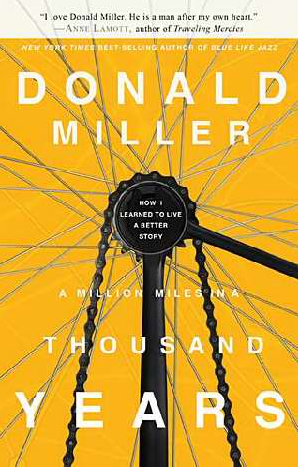 A Million Miles in a Thousand Years details that journey and challenges readers to reconsider what they strive for in life. It shows how to get a second chance at life the first time around. Wrecked is about the life we wished we lived. It's a life of radical sacrifice and selfless service-and how we find it in the midst of suffering. Wrecked is a look at how we discover our life's purpose in the least likely of places: in the tough spots and amongst the broken-hearted. It's a manifesto for living like we mean it; it's a guide to growing up and giving your life away. This book is for us. A generation of young adults pursuing our life's work both responsibly and radically-how to live in the real-world tension of sacrificial living and the daily mundane. Author Jeff Goins shares his own struggle as a missionary and 20-something who understands the call to live radically for God while dealing with the everyday responsibilities of life. Wrecked is for a generation dissatisfied with the status quo and wanting to make a difference. Michael Hyatt, one of the top business bloggers in the world, provides down-to-earth guidance for building and expanding a powerful platform. To be successful in the market today, you must possess two strategic assets: a compelling product and a meaningful platform. In this step-by-step guide, Michael Hyatt, former CEO and current Chairman of Thomas Nelson Publishers, takes readers behind the scenes, into the new world of social media success. He shows you what best-selling authors, public speakers, entrepreneurs, musicians, and other creatives are doing differently to win customers in today's crowded marketplace. Hyatt speaks from experience. He writes one of the top 800 blogs in the world and has more than 100,000 followers on Twitter. His large and growing platform serves as the foundation for his successful writing, speaking, and consulting practice. In Platform, Hyatt will teach readers not only how to extend their influence, but also how to monetize it and build a sustainable career. The key? By building a platform. It has never been easier, less expensive, or more possible than right now. . . The book includes: proven strategies, easy-to-replicate formulas, practical tips. Social media technologies have changed everything. Now, for the first time in history, non-celebrities can get noticed-and win big!-in an increasingly noisy world.